Biostar has become the latest company to be attracted by the lucrative solid-state market. The famous Taiwanese company, mainly known for its motherboards, has presented its first ever SSD line – the G300. The new G300 line currently includes three models with capacities of 120 GB, 240 GB and 480 GB. All models in the line are just 6.8 mm thick and feature the popular 2.5-inch form factor. 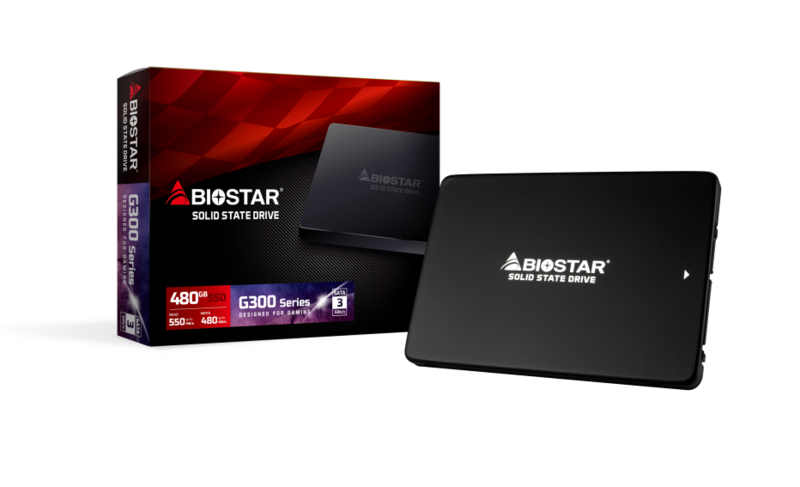 The new Biostar SSDs are based on Silicon Motion SMI2256 memory controllers and feature caches of 128 MB (120 GB model), 256 MB (240 GB model) and 512 MB (480 GB model) as well as support for SATA 3.0. The exact type of memory used is unknown – all we know is that the memory chips inside are NAND. The drives reach up to 550 MB/sec of sequential read speed and up to 480 MB/sec of sequential write speed (470 MB/sec for the 120 GB model). The new Biostar G300 SSDs are on the market now. The 120 GB model sells for just USD 44, while the 240 GB and 480 GB models cost USD 66 and USD 140, respectively.